Thanks to RodGueX for the photo. Note: Lots of people selling tickets in the comments section, so if you're looking to buy or sell, take a look. And all reports from fans getting their tickets from Ticket Factory say that they do NOT have names printed on them. The Eventim tickets DO have names printed on them. And as it says on the Ticket Factory website: "Lead bookers names will appear on The Ticket Factory receipt enclosed with tickets; lead bookers will need to provide matching ID on the evening of the performance to gain access to the venue. " So for those with Ticket Factory tickets, you will need to bring your ID and the receipt with your name on it, not just your ticket. 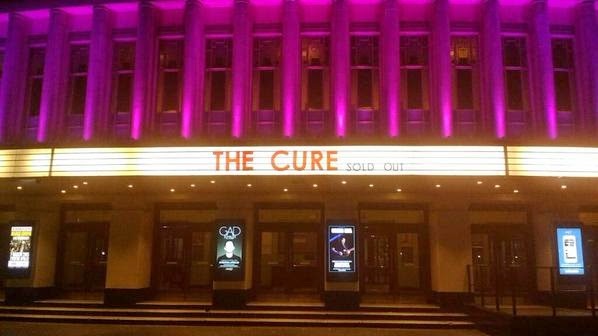 Thank you for booking tickets for The Cure with The Ticket Factory! • All customers will need to bring ID (photo ID or proof of address), which matches the name and address printed on The Ticket Factory receipt enclosed with the tickets. Setlist: The Lovecats (Hackney Colliery Band with Robert singing and Brian Cox on piano, not part of The Cure's set), Friday I'm in Love, Just Like Heaven, Boys Don't Cry. Close To Me. Show finished with Eric Idle doing Always Look on the Bright Side of Life. Robert was onstage for it, but didn't sing with him. Or did he? Conflicting reports. Setlist: The Lovecats (Hackney Colliery Band with Robert singing and Brian Cox on piano, not part of The Cure's set), Let's Go to Bed, Close to Me, Why Can't I Be You?, Boys Don't Cry. As I've said on Twitter, this has to be the coolest, geekiest, and most interesting event that The Cure have ever been a part of. Wish I was there! "The Cure will be performing a small clutch of 'Happy Hits'. How many in a clutch? We think around 3 or so... never quite sure until we count though... and in the act of counting..."
If you're going, and wouldn't mind sending the setlist, photos, videos, thoughts on the show, etc, I'd greatly appreciate it. Thanks, and have a great time at the shows! Rumor: Tour of Germany in May 2015? Okay, consensus from emails and tweets is that this is most likely false. They are a ticket reselling website and post lots of bad info and false shows. Also, Karsten Jahnke, longtime Cure promoter in Germany, says no plans for 2015 shows at this time, and that Ticketbande is not a reliable source. Help with the Christmas shows? If anyone can help me with the reports from the 2 Christmas Compendium of Reason shows and/or the 3 London Cure shows, please let me know. Mainly looking for the live setlist reports, but all reports are appreciated. Updates via Twitter, email, Facebook, or WhatsApp would be best, but can do whatever works best for you. Thanks! From Richard Bellia on Facebook: "Du 8 janvier au 6 février 2015. Exposition à Rouen. Voici le visuel. 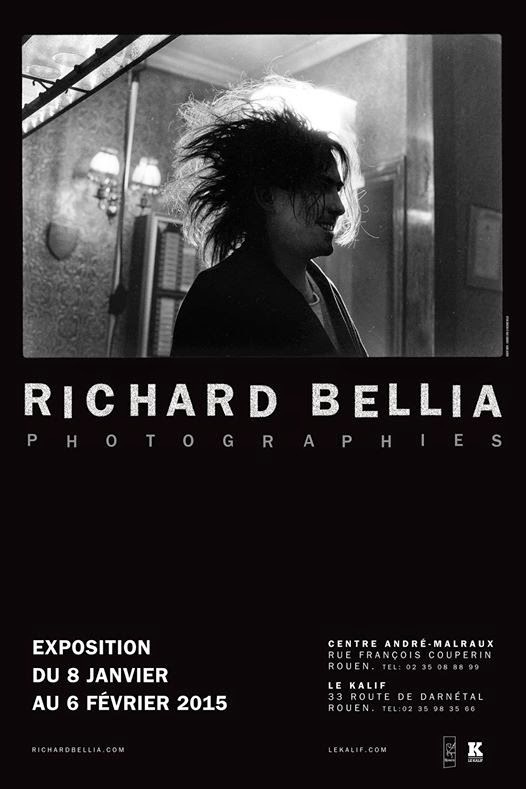 Une affiche va être éditée." Update (12/18/14): Richard has added 4 photos of Porl Thompson to his Facebook page.